The most important concept of real estate marketing is to ensure that your property gets in front of the right Buyer's and Agents. This can only be accomplished if you have expert knowledge of the property, the location, and of the Buyer's for that particular area or type of property. Our marketing materials are of the highest quality, well designed, and easy to read. Our home marketing program will give you an exclusive and distinct marketing vehicle that has an unparalleled look and feel. We produce full colour multi page brochures that showcase your home with top quality photographs, floor plans and all other pertinent information. A high quality direct mail campaign may also be used with feature sheets and postcards. Our online luxury marketing program consists of 2 core components Luxury Portfolio and Macdonald Realty Luxury Properties. 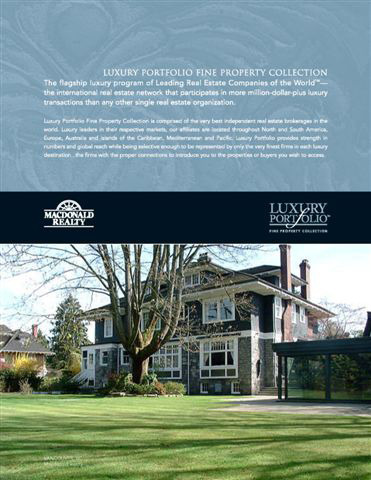 Exclusive to Macdonald Realty amongst a very select few real estate companies in Canada, Luxury Portfolio has more Luxury Home Listings than Christie's and Southeby's combined, with traffic from over 50 countries around the world. 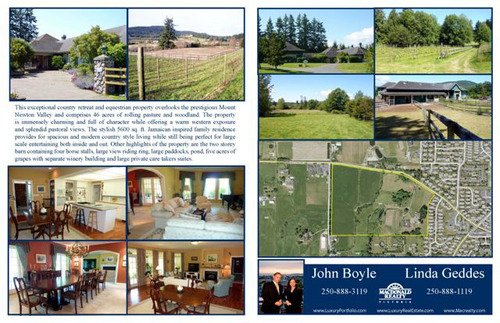 All listings placed on Luxury Portfolio also appear on the Wall Street Journal online. 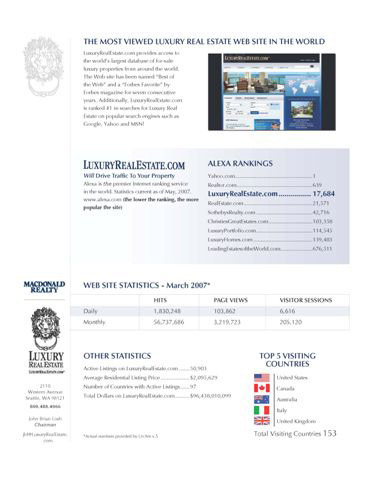 Macdonald Realty is the leading marketer of luxury properties in Western Canada. Macdonald Realty Luxury Properties is a cornerstone of the companies website and showcases it's luxury properties listed through out British Columbia. A customized email colour brochure is created and sent throughout Macdonald Realty's roster of agents, to other appropriate agents, and to our extensive data base of clients, contacts and professional associates. Full colour weekly advertising takes place in the Vancouver Sun which reaches large audeances across British Columbia. 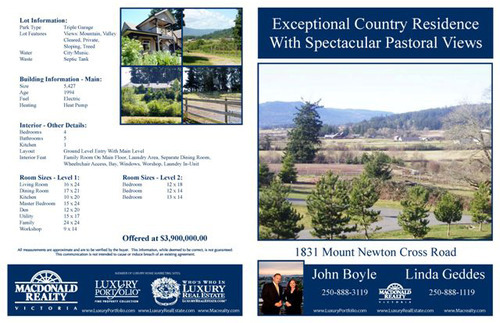 Print Advertising also takes place in Victoria's high profile Homes & Land Magazine, Boulevard Magazine, Macdonald Realty's Luxury Homes Magazine, Luxury Portfolio International Magazine, plus several other publications best suited to target the right Buyer for each unique home and property.